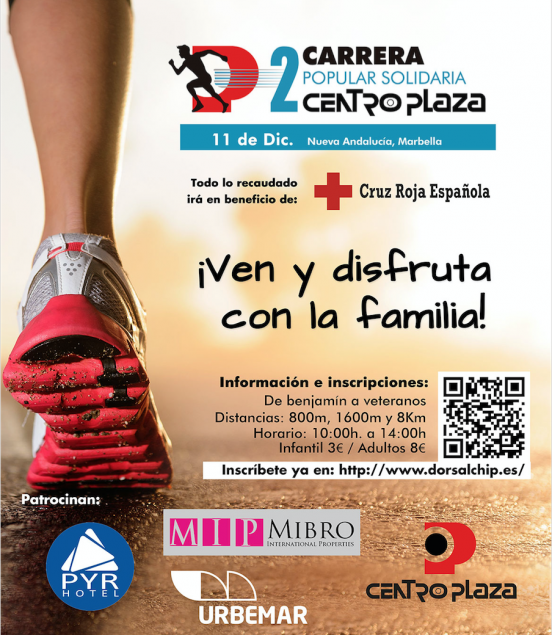 2nd Centro Plaza Solidarity Race in aid of the Red Cross, which is taking place this Sunday December 11th. The run will begin at 10.00am from Hotel Pyr, with the finish line at Avenida Manolete 1. With a total of 500 participants of nearly all ages, the running course, which is of a moderate difficulty level, will cover flat ground, up and downhill slopes, from Nueva Andalucía to Puerto Banús. There will be 4 different distances to cover depending on the participant’s age, ranging from 400m, 800m and 1600m for the younger age-groups, and 8km for the older participants. It is possible to sign until December 8th at midday, with a participation cost between 3 and 8 euros, according to the different age-groups. The categories will be prebenjamín (under 7’s), benjamín (under 10’s), alevín (under 12’s), infantil (under 14’s), cadete (under 16’s), juvenil (under 18’s), junior (under 20’s), promesa (under-23’s), senior (23-35’s) and veteran (35+). The competitor numbers will be given out on Thursday and Friday December 8th and 9th to the Urbemar offices, Av. Manolete, 1, in Marbella between 8am and 3pm. It will also be possible to collect them on the day of the race between 8.00-9.30am at the starting line (Hotel Pyr Puerto Banús).